BBEdit has long been known as the preeminent HTML and text editor for Mac. Many of us were introduced to the program in its lite version, which, alas, is no longer available. I started using the professional version when it came bundled with Dreamweaver. Unfortunately, this lasted for only two versions of the program and then was discontinued. For those of you who are unfamiliar with BBEdit, let me first briefly describe some of the myriad functions it can accomplish. Then I will point out the new features that should intrigue veterans and neophytes alike. Text Editor or Word Processor? If you already have a word processor such as Microsoft Word or AppleWorks, you may wonder why you need a text editor. These are two quite different beasts, however, and perform very different tasks. Most of you know that you can format your text with headings, styles, boxes, and other layout features in a word processor. These programs are proprietary, though, and add lots of metadata that make their documents impossible to open in most other applications unless converters are available. BBEdit can come to the rescue here. It will open any file from any program and allow you to extract the usable portions of text from the gibberish and metadata. Better still, if you have a document that suddenly won’t open even in its native program because it has become corrupted, you can use BBEdit to pull out the relevant text and paste it into a new document. Web Development: BBEdit is considered the best Mac HTML editor out there, and its features include a complete set of HTML and CSS tools, built in FTP and SFTP, integration with Dreamweaver, a palette for entering special HTML character entities, Web-safe color palette, color syntax for various Web related languages, and page previewing. Search: its search features include GREP (Global Regular Expression Parser) style pattern-based searches and multi-file search and replace. Text Handling: An integrated spell checker, display of tab stops, line numbers, Unicode support, invisible characters, and the new text transformation feature (more about that later) all make working with text a snap. Programming: Syntax coloring provides support for over 20 programming languages, comprehensive AppleScript support, integration with the Mac OS X Perl environment, Python, and Unix shell scripts, shell worksheets for storing and executing shell command lines, and command line tools. Now that I have you excited about what you can do with BBEdit, let's look at some of the coolest new features Barebones added to this powerhouse. Appearance improvements: The new version takes better advantage of the aqua interface. Current line highlighting: This is very useful for keeping your place when you’re moving among multiple documents. Text Transformation and Text Factories: BBEdit has always been strong in its search and replace, regular expression matching, and file filtering. In the past, such “text transformations” had to be done on one document, with only one operation, at a time. 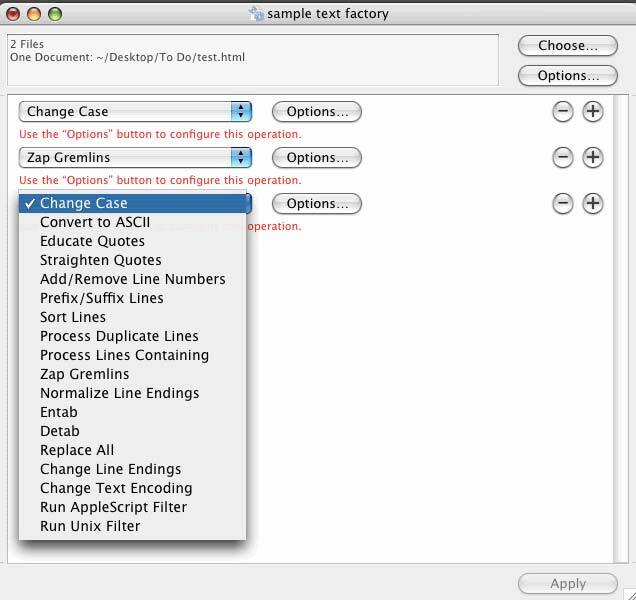 Now, with “Text Factories”, you can apply a series of transformations on any number of documents. Furthermore, you can perform these operations in the background. The new Document Drawer is opened and closed by clicking on an icon at the top right of any open document window. It shows all open documents, and allows you to easily switch among them. BBEdit has thus moved from a single-document to multiple-document per window model. Additional Source Control Management: In addition to CVS, there is integration with the Perforce software configuration management system. Customizable workspaces: Perhaps you want to have one set of palettes and tools open when you’re developing a Web page, and you want another set when you’re programming in C++. You can save custom workspaces for various tasks. My personal bias is towards the wonderful HTML editing features. 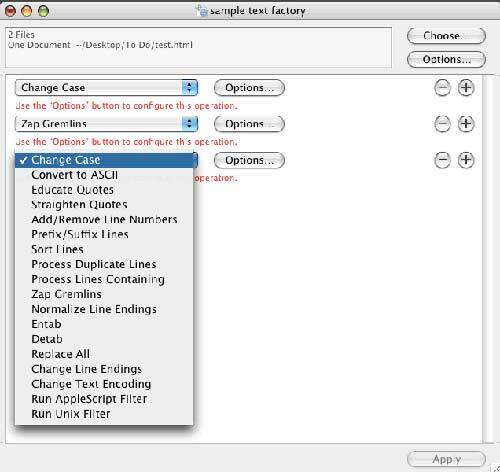 Starting a new document is as easy as filling in the new HTML document dialog box. As you can see in the image, there is popup menu to choose support for Unicode, the correct doctype, language, and other code as required when creating a document that conforms to Web Standards. CSS 2.1 support: There is now support for CSS 2.1 and various media such as Braille, handheld, screen, and print. A built-in HTML Tidy tool will clean up and check syntax on your XHTML or HTML document. Preview Server: BBEdit takes advantage of the Mac OS X Apache installation—and whatever other servers you have installed-- to preview PHP, JSP or other dynamic pages without the need to specify the URL in the browser. HTML Websites: This category allows you to set up as many Web sites as you need. Menu keys allow you to set up keystrokes for your frequently used commands. The HTML Colors preference allows you to choose your colors (whether Web-safe or the Apple Picker), layout, and color swatch size. Application preferences give you access to Mac OS X services and such functions as the ability to allow BBEdit to translate QuickTime documents or refrain from translating PDF. The Documents preference has checkboxes for configuring the new “Document Drawer” feature. BBEdit 8 no longer runs in OS 9, and indeed you must have Panther, Mac OS X 10.3.5, as a minimum requirement. The full retail price of BBEdit is $199, and there is an upgrade price of $49 from version 7.0 and $59 from versions 2.5 to 6.5. There are several other ways to get your hands on a copy for less than the full retail price, however. If you have a copy of BBEdit that came with Dreamweaver 1.0 or 2.0, you qualify for the $59 upgrade fee. If you are lucky enough to still have a free copy of BBEdit Lite, you can purchase the pro version for $129. Finally, you can cross upgrade from Adobe GoLive and Dreamweaver 3 and above for $129. 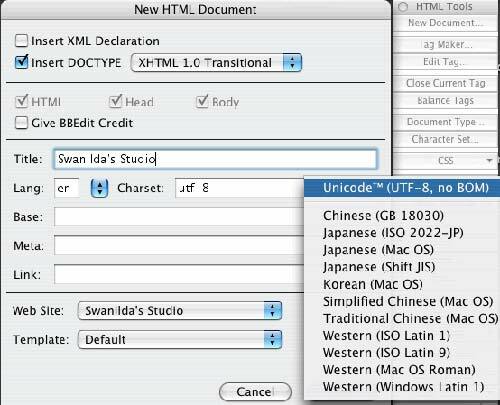 BBEdit has been called "a remarkably powerful text editor for a wide range of users, from Web designers to programmers." If you have been using earlier versions, you’ll surely want to upgrade to take advantage of over 100 new features.